The Flowing Bowl is a tavern located on Anvil's Waterfront. It is found in front of the ship named The Serpent's Wake and next to Lelles' Quality Merchandise. The owner, Maenlorn, will buy anything while only selling food and the unique gauntlets, Fists of the Drunkard, which fortify your Strength and Endurance while draining your Intelligence and Willpower. The ground floor is the main reception area and dining room, and the bedrooms are upstairs. 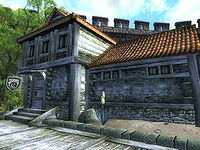 Although The Flowing Bowl is an inn, the rooms on the second floor cannot be rented by the player. They are both heavily locked and the beds are not available for sleep, as entering counts as trespassing. Although Maenlorn's twin brother, Caenlorn, and various Anvil citizens claim that the two brothers run the tavern, Caenlorn offers no services. A handbill advertising the inn reads: "The Flowing Bowl is a great place to eat. For this week only, we are putting twice as many leeks into our soup as normal. Why not stop in for a bowl? Bring a friend!" This page was last modified on 8 July 2018, at 16:36.